The Washington Nationals’ Max Scherzer threw baseball’s 289th no-hitter one year ago today, becoming just the second pitcher to plunk the 27th batter during a perfecto yet recover for the no-no. Scherzer retired the first 26 Pittsburgh Pirates he faced on June 20, 2015, before grazing pinch-hitter Jose Tabata with a pitch in the ninth inning, losing the perfect game. He then got Josh Harrison to fly out to left to complete the no-hitter. Scherzer struck out 10 batters and walked no one. Only one other pitcher lost a perfect game by hitting the 27th batter yet recovered to save the no-no, and it was in 1908. 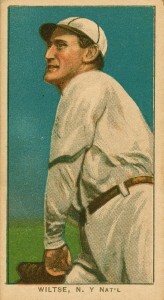 The New York Giants’ George “Hooks” Wiltse retired the first 26 Philadelphia Quakers he faced during the first game of a July 4 doubleheader that year before hitting opposing pitcher George McQuillan on the arm. The game at the time was a 0-0 tie. The Giants scored in the top of the 10th and Wiltse got his three outs in the bottom half to complete the no-no for a 1-0 win. Yep, that was supposed to say “used to pitch for the Detroit Tigers.” Thanks.